Our purpose is to meet the requirements connected to the needs and demands of our customers. We fabricate quality products to exact specifications, and deliver the products in an efficient and timely manner. We have a rapid turnaround rate, and are the best source for emergency projects on job sites. You can rely on us to get your job done. Contact us today, we would love to hear from you! Copyright 2018, G2 Metal Fab. All Rights Reserved. 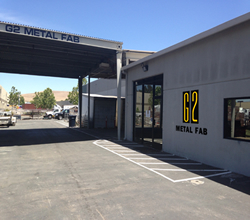 Copyright 2014, G2 Metal Fab. All Rights Reserved.